In 1845 Asa Lovejoy and Francis Pettygrove flipped a coin to determine who would get to name their new settlement in Oregon. Both wanted to pay homage to their respective hometowns of Boston, Massachusetts and Portland, Maine. Pettygrove won two out of three coin tosses, and the area formerly known as The Clearing became Portland. The Oregon Territory was incorporated into the United States in 1849. The Boston Celtics, owners of the NBA’s second best record at 34-10, come to The Rose Garden in Portland tonight to take on coach Nate McMillan’s banged-up Blazers. 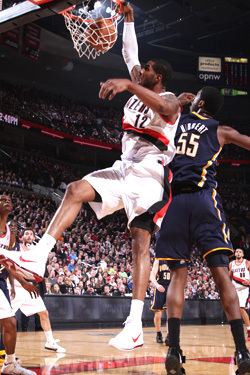 With starters Brandon Roy and Marcus Camby out of the lineup already with serious knee troubles, Portland is hoping that fifth-year PF LaMarcus Aldridge, their active leading scorer and rebounder, will be ready come tip-off against Doc Rivers’ formidable front line. Aldridge had an MRI on his right hip two days ago after hurting himself in the Blazers’ home loss to Sacramento on Monday night, 96-81. The rare home loss ended Portland’s season-high five-game win streak. Even with the defeat, Portland is an impressive 16-6 on their home floor. At 25-21, the Blazers currently sit 8th in the Western Conference. A win tonight would carry added importance because six of their next eight contests are on the road and the two home games in this stretch are against the NBA elite – San Antonio Spurs (best record in the league) and Chicago Bulls (fifth-best record in NBA). experience. However, in the C’s last game, a Tuesday night home win over the spiraling Cavaliers, starting center Kendrick Perkins made his season debut. 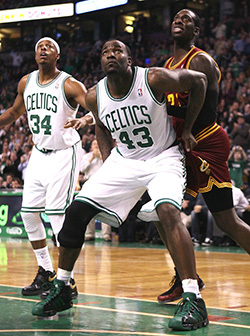 Perk last wore the green and white in game 6 of the NBA Finals in Los Angeles, when he tore his right anterior cruciate ligament. In his first game back, Perkins came off the bench to spell current starting 5-man, Turkish rookie Semih Erden. KP played 18 minutes and had seven points, six boards and three dimes after receiving a lengthy standing ovation from the Garden gathered grateful. A great matchup to focus on tonight is the point guard duel featuring Portland’s 12th year, wily vet Andre Miller and the dynamic Celtic lead guard Rajon Rondo. Former Kentucky Wildcat Rondo leads the NBA in assists at 12.9 and is second in steals at 2.45. In the Blazers’ loss on December 1st in Beantown, Miller had 20 and 6, while the Celtic QB had 10 and 10. Also in that game, the longest-tenured Celtic and 2010 3-point Champion Paul Pierce scored a game-high 28 points. 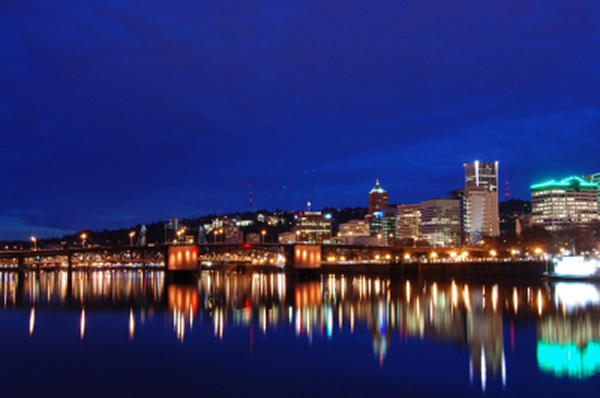 Portland is known as the ‘greenest’ major city in the country. Maybe that’s why the Celtics have been so successful there recently. Boston has won their single regular season visit to Rip City in 7 of the last 10 years, including last year’s 96-76 blowout. Tune in tonight at 10:30 PM ET on TNT as the eastern-most franchise in the NBA visits the league’s western-most franchise.